Across America, in communities large and small, more than 10,000 American Express financial advisors provide over 2-million clients with the financial products and services they need to make the most of their lives. They offer everything from financial planning to brokerage services and retirement accounts to life insurance and annuities. Much more than mere salespeople, American Express financial advisors are trusted, respected professionals whose clients rely upon them to provide the advice and counsel needed to make sense of today's complex array of financial options. Who are these people? Where do they come from? They're a hugely diverse group — men and women, young and old, from all walks of life and cultural backgrounds. But all are highly trained, well-motivated financial experts, respected community professionals who build long-term client relationships by offering reliable, unbiased advice and an array of competitive financial products. Some are salaried employees. Some run their own business. Some are new to the job, spending much of their time prospecting and building a clientele. Others are more established, concentrating on servicing existing clients and maintaining relationships. But all are backed up by the American Express Financial Corporation, a $285-billion company and one of the most trusted names in the country. Surprisingly, most come to American Express from another non-financial career. Teachers, health-care and social workers, small business owners, corporate managers, military personnel, government employees — the list is virtually endless. Others come from the financial services field while a small number join American Express directly from college or university. Today, an opportunity exists for you to become an American Express financial advisor. We're growing by leaps and bounds (in fact, we expect to double in size by 2008) and we need a select number of good people to grow along with us. It's not the easiest job in the world. There's a lot to learn and a lot to do. Like all professional people, you must be prepared to invest a fair amount of time and effort in establishing your practice. On the other hand, while a career as an American Express financial advisor may not be the easiest job, it is most certainly one of the most rewarding. You'll enjoy the respect of your community and the good feeling that comes from knowing that people are counting on you — counting on your skills, counting on your good advice, and counting on you as a reliable person they can trust. You'll also enjoy the financial rewards American Express offers. You can work as a salaried employee or as an independent contractor with compensation based directly on performance. As your business grows, so does your income. There is absolutely no limit and many of our financial advisors enjoy an income and lifestyle similar to doctors, lawyers, and other successful professionals. But it doesn't stop there. If you've got the drive and entrepreneurial spirit, we offer the opportunity to own and operate your own American Express franchise office. How far you go is up to you. But one thing is certain — to go anywhere, you must take the first step. Brass Ring online app goes here. Brass Ring profile builder goes here. The financial services industry is one of the fastest-growing businesses in America. It's no surprise, really. Economically, the country is richer than it's ever been. And the population is aging. So as Americans find themselves with rising incomes and increasing assets, they also find themselves looking for ways to prepare financially for their future. The financial services field is also one of the most hotly competitive businesses in the country. To be successful, you need to stand out from the crowd. And no one stands out better than American Express Financial Advisors. We're part of the American Express Financial Corporation, a $285-billion company. We've been marketing our charge cards (remember "Membership has its privileges"), our travel services ("Don't leave home without it"), and our other financial services for more than 100 years and have become one of the country's most trusted financial institutions. That name recognition is key. As a financial advisors, you'll be representing one of the best-known names in America. We're a complete financial services company and always have been. We're not an insurance company with a few mutual funds added or a bank with a couple of insurance products. Our product line is comprehensive — we offer everything from individual securities and mutual funds to life and disability insurance to retirement accounts and annuities. But more than our size, reputation and product line, what makes us truly stand out is our commitment to client service. And that's where you come in. As an American Express financial advisor you'll be responsible for prospecting and locating clients, setting appointments with potential clients, meeting prospects and analyzing their financial needs, preparing financial plans, recommending and selling specific products, servicing current accounts and maintaining client relationships. It's a challenge, but an interesting and rewarding one. Let's look at each part of the job in turn. In the early years of your career, you'll spend much of your time prospecting for new clients. This is the only way to build your business. If you've never done it, don't worry. It's not like you see in the movies (at least, not at American Express). We don't stick you in a room with a phone book and tell you to call everyone in town. In fact, we don't cold-call at all. As a financial advisor, you'll have access to company leads — people who've written to us requesting information about our services. You'll arrange and conduct financial planning seminars. You may meet people at information booths or by representing American Express at trade shows. You'll also want to pursue your "natural market," your friends, acquaintances and business associates who know and trust you and may be open to the financial services you're now able to offer. And later, as you acquire clients, you'll find many of them willing to provide referrals. Of course, you won't be doing this alone. Your office manager and other financial advisors are behind you all the way. They'll be there to show you the ropes and pass on their years of experience. And until you feel confident on your own, your manager will be right by your side as you take the first steps to building your business. Prospecting becomes a lesser part of your job as your business grows, but it remains a crucial element. No matter how large or successful your business, locating and attracting new clients will always be a key part of life as an American Express financial advisor. It's one thing to meet people, quite another to turn them into clients. Meeting people and making a good impression is just step one. To be successful, you need to persuade some of those people to meet with you at another time to discuss their financial needs. Of course, the more people you meet, the more chance there is of an appointment. But a lot is up to you. It's not a numbers game. You've got to be able to take that all-important next step from initial meeting to a definite appointment. If you can't do that, meeting more and more people won't help. Once again, your manager is here to help. As you work with your manager, you'll discover that setting an appointment is often just a matter of asking for it. You manager is there to show you how to make setting a later appointment a natural part of any encounter. Financial planning is the cornerstone of our business. The high-pressure product sell doesn't interest us. Nor does the discount, self-serve approach. At American Express Financial Advisors, we gain the trust and respect of our clients by listening carefully to fully understand their needs, applying our superior training and technology to developing creative ways to meet those needs, then recommending appropriate financial products. Your interpersonal skills are important here. You're asking people to open up and divulge personal information and future goals to someone they may have only recently met. Empathy and understanding go a long way. After the interview, and armed with the information from your client meeting, you'll prepare a comprehensive financial plan. This is a valuable service and we charge clients a fee for it. 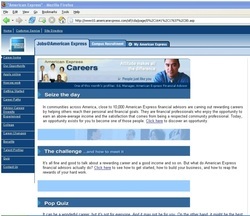 To make the task a little easier, American Express has developed and will provide you with a suite of financial planning computer software to help you provide the high quality advice that clients expect. And here comes another all-important step. Once you've prepared and presented your financial plan, you must be able to help your clients take action by purchasing the products you've suggested. And once again, your manager is here to show you how to make that a natural part of the process. As you continue to work with your clients, you'll find that they come to trust you and rely upon your advice, counsel and good judgment. You'll find the relationship developing steadily, becoming ever stronger. But that doesn't happen by accident. You've got to work at it. Good advice and good products certainly help. But a relationship isn't about products, it's about people. You need to know when to offer advice and when not, when to suggest a new product (a college fund for new child, for example), when to change the financial plan and when to stay the course. You'll need to see how different people think in different ways and how to tailor your approach. Training helps here and your manager will offer much good advice, but developing relationships calls for more. It calls for heightened interpersonal and communications skills, a sense of compassion and understanding all combined with a hefty dose of down-to-earth common sense. You may already have those skills. And you may have just found the right place to use them. American Express offers two ways to gain the training and licensing needed to pursue a career as a financial advisor. § American Express pays your licensing fees. § We pay you an hourly rate of pay plus overtime. § We offer self-study and classroom training to prepare for your licensing exams. § We provide specific training on American Express topics. § You take and pass all NASD and state license exams. § If you fail an exam, your employment is terminated. § The offer is valid for six months. § American Express sponsors your license application, but you pay all fees. § You pay for your own study materials and any courses needed. § When you receive all required licenses and pass a background check, we make you an offer of employment as a Pre-client Ready financial advisor. § Once hired, you receive a hiring bonus of up to $3,000, based on the time taken to obtain your licenses. § Upon hire, you are paid an hourly rate of pay and enter a six-week American Express training program. The fact that your success and level of reward is based on your own performance, is one of the most appealing aspects of a career as an American Express financial advisor. But how independent do you want to be? American Express offers two options. The Employee Financial Advisor career platform offers somewhat more company support and guidance, while the Independent Financial Advisor platform has been designed for the more independent-minded person. If you're currently working and successful as a financial services professional, consider a move to American Express Financial Advisors. § Is an integral part of American Express, contributing fully 38% of AMEX net income. § Serves more than 2-million clients across America. § Manages more than $230-billion in assets. § Has sold more than 1-million financial plans. § Currently employs more than 10,000 financial advisors nationwide. § Is growing by 20% annually. § Has had a 95% customer retention rate for the past 10 years. If you're looking to make a move to a financial services firm with a name people recognize, with a full range of products, with a choice of career paths and compensation packages, and with the future potential to acquire your own office and run your own show, look no further than American Express Financial Services. Life looks great from college, doesn't it? It seems like you've got your whole life ahead of you and the world has a lot to offer. No wonder, everyone seems in such a hurry to graduate. But if you're a new graduate and you've looked around at what the world is offering, it can be a pretty depressing sight. Boring companies. Dull jobs. A desk and a cubicle. No respect. Low pay and not much chance of a raise. American Express Financial Advisors, on the other hand, is offering something different. A career with us is never boring. You're hip deep in the ever-changing world of personal financial services. You're meeting new people every day. You're a respected professional who others look to for expert advice and guidance. And the pay can be good, too. In fact, if you put in the time and effort to get your career off the ground you may be enjoying a comfortable income while your college buddies are still trying to make rent. The job's not for everybody. And to be honest, you do have to work a little harder if you're starting straight out of college. But if you've got what it takes and you're willing to work at it, you may find that the world actually does have a lot to offer. Who me? A financial advisor? Many of our most successful financial advisors said that at some point in their lives. Fortunately, we were around to say "Yes, you." We still are. Fact is, most American Express Financial Advisors do not come from the finance industry. They're teachers and business owners and nurses and lawyers and ... well the list just goes on and on. They come from diverse backgrounds, but they all have one thing in common. They've all taken the skills and knowledge and experience in one career and put them to work in a new one. They're using their interpersonal skills to locate and meet new clients. Empathy and listening skills to uncover financial concerns and goals. Math and computer skills to develop financial plans. Communications skills to present those plans clearly and with confidence. Selling skills to turn recommendations into sales. Management and business skills to develop and maintain relationships with clients. What skills do you have? And have you thought about putting them to work as an American Express Financial Advisor? You've spent most of your life acquiring knowledge then passing that knowledge on to others. You've gained valuable communication and motivational skills that you can put to work with us. You've developed a strong sense of empathy and caring. You've learned how to uncover people's needs and desires and help them do what it takes to fulfill them. And that, in a nutshell, is what our job is all about. Have your dreams of standing up as an advocate for your client's best interests become buried in a mountain of petty paperwork and partnership politics? Why not drop the adversarial life and join an organization where win-win is company policy. Tired of cubicle politics, tiresome pointless meetings and a salary package based on the mood of the boss or the temperature at head office. Maybe it's time for a career where your reward matches your effort. Insurance Agents — You've worked hard to build a client base and establish a relationship of trust with your clients. But they only need so much insurance. Now if you could also offer investment products, savings plans and retirement accounts, well that would open up a whole new world, wouldn't it? Military Personnel — You never prepared a financial plan for the Army, Navy or Air Force. But you probably picked up a solid work ethic, a strong sense of self-motivation, and perhaps a network of service buddies who may have a genuine need for the financial services you're now able to offer. Didn't see your current job here? No surprise. We just don't have space to list the incredible variety of jobs that can lead to a successful career as a financial advisor. But if your present job has taught you to be open to new learning, to work well with people, to listen, to communicate clearly, to be persistent, to be organized, to be honest and ethical and to work hard, then you may be extremely well prepared for a rewarding second career with American Express Financial Advisors. I'm a Certified Public Accountant. We're careful people. We don't take anything for granted — we check, double check and check again. Five years ago. I was working for a big, multinational entertainment company and hating it. The office politics made it really hard to do your job. The burnout rate was high and employee turnover meant we we're always understaffed and overworked. And I was just a cog in a big machine — I had no control over my own life. Through a professional group I'm involved with, I attended a seminar on achieving financial success hosted by American Express financial advisor, Kevin Marumoto. He really impressed me with his depth of knowledge and ability to communicate. I started thinking this could be a great life for me. I called Kevin and asked him about a career as a financial advisor. Actually, "asked" isn't the word, "grilled" would be more accurate. I put poor Kevin through call after call after call while I grilled him on the job, the training, the licensing process, my obligations to the company, compensation, etc, etc, on and on and on. I knew that I enjoyed working with people, my communications skills are strong, and my financial knowledge was extensive. But I wanted a career that would let me put those skills to good use and I wasn't about to take on something without knowing exactly what I was getting into. Kevin once told me that, of all the people who've asked him about a career with American Express Financial Advisors, no one has grilled him like I did. That was three years ago. Today, I'm a successful independent financial advisor. My client base is solid and growing. My clients respect my professional knowledge and concern for their welfare such that, even in today's slumping market, they're sticking with me. Right now, I'm looking at a long-term plan. Five years from now, I expect to be working with 150 to 200 "A-list" clients. I'm certainly going to expand my practice and perhaps take in a junior partner. It's an ambitious goal, but I know I'll make it. Because I'm the right person in the right place. All that grilling has really paid off for me. People say "what's a gospel singer doing as a financial advisor?" My answer: "doing great and loving every minute of it!" I'd been singing professionally for about six years and I was starting to get tired of the long days and late nights. I'd put out six CDs, some videos and a whole bunch of TV appearances, but I was looking for a big-time life change. I'd been an AMEX client, but I never thought about it as a career. Before becoming a singer, I'd worked at an executive level in the insurance industry, but I didn't want to go back. It's such a boys club. And your income is tied to politics and luck, not to how good you are or how hard you work. One day, I took a friend of mine to an American Express Financial Advisors recruiting conference. I just went along to be with my friend, but as I learned more and more about the opportunity, I suddenly said to myself, "I should do this. I can really make it with this." Well to cut a long story short, I interviewed, got in, got licensed, took the training and got going right away. I didn't have much of a natural market (my friends are spread out all over the world) so I started small. But being an entertainer taught me to really connect with people. That, plus my organizational skills, meant that I could lever a small initial client base into something really big. From the very beginning, I stressed the financial planning aspect. I do a lot of that — far more than most people. So I know my clients really, really well. And that leads to a rapport. And that leads to referrals, which is the foundation of my business. Three-quarters of my new business comes from referrals. Last week, for example, I took five referral calls. That's typical for me. It's a simple plan — start small, offer unbeatable service, generate referrals, and watch your business grow. It works for me. Today I'm in the American Express Financial Advisors top five percent nationwide and a member of the life insurance Million Dollar Roundtable. And let me tell you, that's something to sing about. As a district manager, I see all sorts of people come into this business. I see who makes it and who doesn't. And I can tell you, there's just one thing that makes the difference — attitude. The people that do well as financial advisors are the people who come in from day one, 100 percent committed. They're not here to "try it out" or "give it a shot." They've done their homework, they know what they're getting into and they've made a total personal commitment to becoming a success. That's how I made it. I was a golf pro and before that a banker. I wanted to get back into the financial services arena, but in a way that would allow me to build long-term, mutually beneficial relationships. I didn't want to be a stock jockey, going for the high-pressure, quick sale. Insurance was too narrow. And the income potential in retail banking was nowhere near what I was looking for. With my banking background, licensing was no problem for me. And through my golf pro career I'd developed strong interpersonal skills. But the American Express training program really showed me how to put it all together in a focused way. From day one, I worked my natural market. I didn't have a particularly big circle of family and friends, but unlike many people, I maximized what I had. It's easy to find excuses, to whittle your natural market down to nothing by saying "this person has no money" or "I'd be uncomfortable talking finances with this person." New advisors often do that. They don't want to "sell" to their friends. I took the opposite view. I knew that what I was able to offer was a valuable service that most people genuinely need. I went out there to help people, and the closer someone was to me the more I wanted to help them. That was my attitude when I started and that's my attitude today. This job isn't for everybody. You've got to put in a lot of sustained effort. And you need to be able to handle the ups and downs. But for the right kind of person, it's the best job in the world. If I can offer one piece of advice to someone considering a career as an American Express financial advisor, I'd say don't go into this without a solid game plan. You've got to sit down, look at your life situation and figure out where you're going to get your leads from, how you're going to pursue those leads, and how you're going to turn those leads into clients. I was a lawyer before I came here, but I wanted to move over to the financial side. I looked at the banks, but they're far too corporate and inflexible. The brokerage firms were too focused on return on investment; they're only concerned with taking over portfolios and managing money. The insurance industry stressed relationships, which I like, but it's too concentrated on a single product. American Express Financial Advisors offered just what I was looking for — an opportunity to work with people over a long period of time, help them achieve their goals and build a relationship based on mutual trust. I worked out a game plan and I've been working that plan ever since. My previous career has given me a large natural market so I concentrated on building relationships within that market. Relationships are more important to me than quick sales. I'll cultivate a relationship with someone even if they're not ready to work with me right now because a solid relationship will always lead to referrals. I'm a big believer in referrals. It's much easier to start working with someone who was referred to you than someone you met cold. I always tell new advisors "the warmer your leads are, the more you'll enjoy this job." You can build a client base by bangin' on the phone, but it's a hard way to do it. Better to identify a natural market and work with that. I meet a lot of young people starting out and I tell them that you don't have to be an ex-lawyer or even an ex-anything to make it in this career. Just because you haven't worked much before, doesn't mean you haven't built relationships and doesn't mean you don't have a natural market. Your natural market is everyone you've ever met. And you can build a great career out of that. I majored in English with a minor in religion and sociology, so naturally I'm a financial advisor! Actually, that's not so far off as it sounds. This job really isn't about crunching numbers. It's about communicating and it's about building relationships. I've always been a people person, so I wanted a career that would let me do that. And I grew up in a sales environment (my parents own a large real estate office) so I wanted the unlimited potential that you really only get in sales. I found both with American Express Financial Advisors. Most financial advisors come into the field as a second career. They've got a large natural market and they work that. But I'm living proof that you can enter this career as a young guy, straight out of college and, if you're willing to put in the effort, make it in a big, big way. I'm constantly prospecting. The way I see it, there are four-million people in Atlanta. If you can't find prospects, you're missing the boat. When I prospect, I contact my friends and my family. I do seminars. I pursue referrals — a friend of mine may be young and not in a position to be investing, but he may know someone I can work with or he may invite me into his workplace to give a seminar. I also make good use of the American Express company lead program. There is gold in those leads. It's just a matter of reaching out, contacting people, establishing a rapport on the phone, making the initial appointment and taking it from there. If you follow the leads, you will get clients. Today, less than three years into the career, I work with more than 200 good clients and my practice is flourishing. More importantly, I'm actually changing peoples' lives, using my knowledge to help them make positive life changes that will benefit them and their families. I'm out there making a difference. My next step is to become an independent advisor. Later, I intend to open my own franchise office. I'm also looking forward to hiring an assistant to handle administration, which will free me to do the high-end client work I enjoy. It's really up to me how my career unfolds. Most people are slaves to some corporate master. But not me. I'm in total control of my own destiny. Is American Express right for you? As we've said before, this is a great job but it's not for everyone. It may not be for you. On the other hand, it may be the career you've been waiting for. Why not take this short quiz and find out? 0 to 4: Well we said the job wasn't for everyone. And you may possibly be one of those people. Think it over. You might realize that career as a financial advisor may not be your best choice.